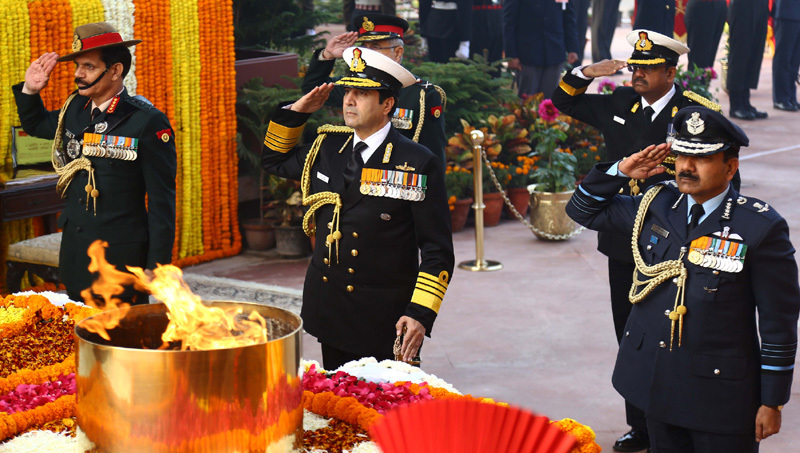 The Chief of Army Staff, General Dalbir Singh, the Chief of the Air Staff, Air Chief Marshal Arup Raha and the Chief of Naval Staff, Admiral R.K. Dhowan paying homage at Amar Jawan Jyoti on the occasion of 67th Army Day, in New Delhi on January 15, 2015. The nation observes Army Day today. The Indian army is ever ready to come to the aid of the nation beyond battle fronts be it natural disasters or even internal security threats. The day 15th of January marks Lieutenant General K. M. Cariappa’s taking over as the first Commander-in-Chief of the Indian Army from General Sir Francis Butcher, the last British Commander-in-Chief of India, in 1948. On the occasion of Army Day, Prime Minister Narendra Modi hailed the armed forces for their sacrifices and valour. The Prime Minister lauded the soldiers saying the nation is proud of their dedication and determination.